Visit Dr. Ernie Ward at www.DrErnieWard.com or on Facebook. One of the most challenging aspects of aging is isolation and loss of social interaction. Whether homebound due to physical challenges or illness, many senior citizens may begin to feel cut off from the outside world and struggle with depression. Those feelings of loneliness can lead to stress, anxiety, and medical complications. A new study proves that pets can cheer up lonely seniors and enhance quality of life. But we pet lovers already knew that. Psychiatrists at the University of Rochester Medical Center examined 830 primary care patients over age 60. The researchers understood from earlier studies that older adults who reported feelings of loneliness were at increased risk for many serious physical and mental health conditions, including early death. They wanted to determine if social-connectedness, especially pet ownership, could promote health and well being in senior citizens. In other words, would owning a pet decrease an elderly person's loneliness and improve their health? 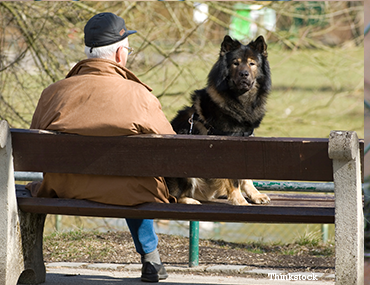 The group most likely to report feelings of loneliness was those living alone without a pet. When the psychiatrists adjusted for living status (alone or not alone), age, and happy mood, they found those living with pets were 36% less likely than non-pet owners to report loneliness. That means 36% more seniors likely to be happier in my book. Fewer people suffering from loneliness means happier and healthier humans living longer, more fulfilling lives. Sign me up! The University of Rochester examiners concluded that pet ownership could help spread feelings of social connectedness and significantly decrease feelings of isolation in older patients. They further postulate sharing a home with a pet could improve an older person’s overall well being. I believe pets have the power to heal our hearts regardless of an individual’s age. This study demonstrates how influential that healing power is for those most in need. If you know an older person living alone and struggling to find motivation to get out, I encourage you to visit them with your pet. Ask them to pet-sit for you. See if they’d be interested in fostering a homeless pet. I strongly urge everyone, especially those living alone, to consider sharing their home with a pet. The more people interact with pets, the more likely they are to interact with other humans and shrug off depression. During my twenty-plus years of veterinary practice, I’ve seen more than one case of a pet literally saving their owner’s life, just by being there. Many people need a reason to get up in the morning, go for a walk, and visit the grocery. Without a purpose, many seniors fall into harmful patterns of behavior that ultimately lead to depression, illness, or worse. Many times the best prescription for healthier living comes with four legs and fur. If laughter is the best medicine then pets must be the best cure. But we pet lovers already knew that.